VERY rare and simply fantastic, 1860's Civil War Quarter Plate Cased Tintype Photograph of a double armed, bearded Union Soldier believed to be from the 140th Regiment, Pennsylvania Volunteer Infantry!! This outstanding, period Tintype Photograph measures approx. 3 1/8" by 4 1/8" and is housed in a beautiful, Gutta Percha / Thermoplastic, Union Hard Case with original matt and binding and a replaced cover glass. The Tintype is a wonderful, full length portrait of the Soldier standing at near attention with a carbine rifle and affixed sword bayonet and with another sword bayonet in a sheath at his belt. He wears a kepi, enlisted man's frock coat, oval belt plate and shoulder scales. He also has a cartridge box on his belt. 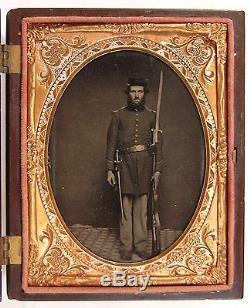 There is a modern note affixed to the back of the Tintype that states that the Image came from Somerset, Pennsylvania and that the soldier pictured may be from the 140th Pennsylvania Infantry. This note also identifies the carbine as an 1859 French "Carbine de Vircennes". This very rare and wonderful, Civil War Tintype Portrait of a double armed Union Army Soldier is in very good condition. The focus is sharp, the contrast strong and the tonality rich and warm. The Tintype is clean and crisp and well preserved with a very few shallow bends but no significant surface scratches, scuffing or damage of any kind and no repairs. The surface is sound and stable with no crazing or flaking. Overall the Image is very well preserved and displays beautifully! The Union Case is very beautiful and very well preserved. It is a rich, chocolate brown color and is geometric in pattern with identical front and rear halves. The pattern is designated as 3-585 Geometric by Berg. The Case is in excellent condition. The molded images on both sides are crisp and sharp with not even a hint damage or wear to even the highest points of the design. The surface is bright and retains its original brilliant surface shine. Two of the eight corners have tiny chips and there are 2 miniscule nicks on one edge but the other corners are sharp and without chips and there are no significant edge chips, wear, cracks, repairs or damage of any kind. A rare and wonderful, 1860's Civil War Quarter Plate Cased Tintype Photograph of a double armed, bearded Union Soldier believed to be from the 140th Regiment, Pennsylvania Volunteer Infantry and a fantastic addition to any collection! And Click Here to Add Us To Your Favorite Sellers List. Click Here to Discover More About this Item and Many Others on Our New Informational / Non-Commercial / Reference Blog - Walnutts. The item "1860's CIVIL WAR 1/4 PLATE TINTYPE PHOTOGRAPH OF DOUBLE ARMED UNION SOLDIER" is in sale since Friday, July 31, 2015. This item is in the category "Collectibles\Militaria\Civil War (1861-65)\Original Period Items\Photographs".